(Bloomberg) Juiced by President Trump’s tax cuts, business investment helped deliver a robust U.S. economy in the first half of 2018, but signs have multiplied that the growth driver is faltering. 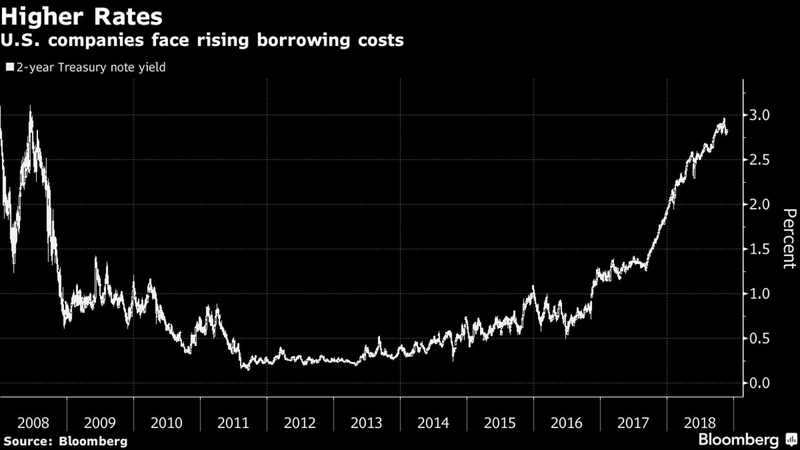 Companies face tariff-related uncertainty, cooling global demand and rising borrowing costs while plunging oil prices are menacing the energy sector. Meanwhile, the U.S. and China are settling in for a protracted trade war, the boost from lower taxes is projected to fade next year and a politically divided Congress will probably shirk from additional stimulus. These challenges will test corporate America’s appetite to invest in the kind of faster-growth, higher-productivity future the Trump administration has promised. While such spending picked up in early 2018 after plodding along for years, a string of weak reports raises questions about the outlook. With firms using tax savings for buybacks and dividends rather than investment, the best gains may already be over. Cummins Inc., Whirlpool Corp., Caterpillar and Stanley Black & Decker Inc. recently cited higher costs from the trade war. The strength of capital expenditures -- or capex -- may be the key to determining whether U.S. growth can continue outpacing peers, how much higher the Federal Reserve can raise interest rates, and whether the dollar’s value will keep rising. The trade war and likely political gridlock after the midterm elections pose “the biggest uncertainty for capex and therefore U.S. rates and the U.S. dollar,” said Woo, who’s analyzed the economy and markets for almost a quarter century. Referring to the recent slowdown in investment, Fed Vice Chairman Richard Clarida on Tuesday indicated incoming data will be critical to the pace of interest-rate hikes next year. “One data point does not make a trend, but an improvement in business investment will be important if the pickup in productivity growth that we have seen in recent quarters is to be sustained,” Clarida said in a speech in New York. Trump and Republicans sold the corporate tax cut and full and immediate expensing -- which gives companies an immediate tax break for investing -- as a way to rev up the economy and pay for the $1.5 trillion cost of the new tax law. While few expect capex to collapse, there’s a growing debate over business investment, which encompasses spending on equipment, on structures such as factories and offices, and on intellectual property and software. Before the recent plunge in oil prices, the energy-sector rebound helped pump up capex and manufacturing. Then, deregulation and corporate tax cuts added a sugar high, until recently: Nonresidential investment slowed to a crawl last quarter. White House economic adviser Larry Kudlow acknowledged as much, but said last week business spending is booming again. On Jan. 1, tariffs go up to 25% on $200B of imports from China, a critical player in manufacturing supply chains, and Trump has threatened to impose levies on everything imported from the Asian nation -- which would further elevate materials costs and worsen supply disruptions. 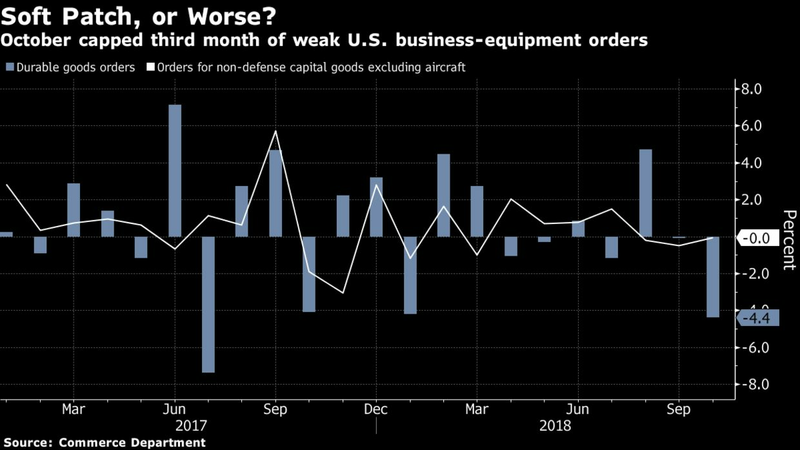 Yet orders at U.S. factories for non-military capital goods, excluding aircraft, were weak in October for a third straight month. The Institute for Supply Management’s manufacturing index fell to a six-month low in October, and regional Fed gauges cooled. The economy is projected to expand at a more moderate pace this quarter and soften further in early 2019. The escalation in tariffs could set off a chain of negative events, including reduced forecasts from companies and a hit to margins, she said. The biggest unknown is whether investors sour on the growth story and cause financial conditions to tighten. The latest ISM manufacturing survey showed more than 40% of the comments from respondents in recent months were related to tariffs, with trade uncertainty continuing to push companies to evaluate whether to invest or adopt a wait-and-see approach, or even consider expansion outside the U.S. Recent market jitters reflect concern about trade. A business-investment slowdown also would have implications for the economy’s long-term speed limit and inflation. Without investment growth at an adequate pace, productivity is likely to stay mired in the rut of the past decade. That means less room for wage gains, which have been the missing piece of the strengthening job market throughout this expansion. Stephen Stanley, chief economist at Amherst Pierpont Securities LLC, is optimistic, arguing the recent capital-spending weakness reflects “more of a breather than the end of the line” for the tax-cut boost. He said investment should stay elevated and the impact may pay off over several years with higher productivity. For now, the question is whether demand is steady enough to encourage executives to increase investments in buildings, machines and software. “The biggest tax levied by Washington is the uncertainty tax,” said David Kelly, chief global strategist at JPMorgan Asset Management.